I will be reading a couple of Big Books this summer, so I guess I am in. Too fun.. happy reading for both of you! Yay! Glad to hear you are joining the fun again this summer! I look forward to reading your kickoff post! I will be back tomorrow with my link up! This sounds like so much fun. I linked up today! Happy reading all! Great! I read your kickoff post, but I couldn't find any way to leave a comment - you might want to check into that (if you want comments, that is). Glad you decided to join the Big Book fun! Looks like an awesome list of Big Books for you - the only one I've read is IT (many years ago!). Enjoy! I made them pages which seems I need to make them blog posts since I cannot seem to find a way to make it able to have comments. So, here I go making a ton of blog posts once again! Ah, yes, that makes sense. I guess you are new to blogging then? Pages are generally permanent anchor points within your blog - my pages are the ones listed in the menu bar across the top of the blog, just below the blog name - Book Reviews, TV reviews, 2017 Challenges, etc. Then blog posts are the ones you write on different days, that will be dated and posted at the top of your blog in chronological order. That's generally how it works (though here on Blogger, my pages also allow comments, as well as posts). Check your settings to be sure you have commenting turned on. I've been looking forward to this challenge! Not entirely sure what I'll read, but Voyager by Diana Gabaldon is on the list for August. Yay, I'm joining in again. Maybe this time I can actually finish two I had started but not yet finished! Yay! A challenge is always good incentive, isn't it? Enjoy! I do have a stack of hefty books that I've never gotten around to reading...great idea! Great! Hope you'll join the fun!! What a fun challenge! Since I'm doing book-a-day this summer, you'd probably think I didn't want to do this, too. But I'm reading You Can't Go Home Again, and I'm pretty sure that qualifies. I like this challenge. There was one challenge I saw in which the book had to be over 600 pages. This is definitely doable for me. I have a few books over 400 pages on my TBR for the year. 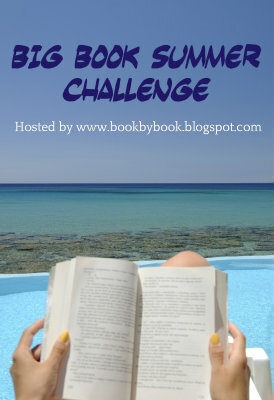 Question: Are you just doing this challenge for the summer? Yes, it's just for summer - all the details including the dates are up above in the post! You still have a full month, so join the fun! Just add your sign-up post to the first link-up above. I am finally on with a book over 500 pages. I think I will have at least one more long/big book before summer's end. I may have to change the Big Book I originally intended to read this summer. I am in the middle of two others! Change away!! Your initial post is just some possibilities of what you might like to read - nothing wrong with changing your mind :) I have changed my Big Book list quite a bit this summer!